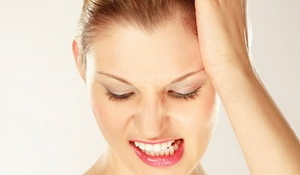 If you think you suffer from bruxism, ask your dentist for options that might ease your pain. There’s nothing worse than waking up feeling more tired that when you went to sleep the night before. Waking up with a headache is even worse. Headaches are the “number one pain problem” in the U.S. and affect approximately 40% of individuals, according to the American Academy of Craniofacial Pain (AACP). The Bruxism Association reports that 70% of teeth grinding in adults is related to stress or anxiety. Other factors that contribute to teeth grinding include smoking, drinking alcohol, sleep apnea (pauses in breathing during sleep) and caffeine. Tooth grinding also occurs in children, but the causes are different. Misaligned teeth, mouth irritation or allergies can cause kids to grind their teeth. Most kids outgrow tooth grinding by adolescence. If you suffer from headaches, a sore jaw or facial pain, see your dentist. Treatment varies, but typically includes being fitted with a mouthguard to help prevent tooth damage while sleeping and finding ways to cut the stress in your life – exercise, meditation or counseling can all help.